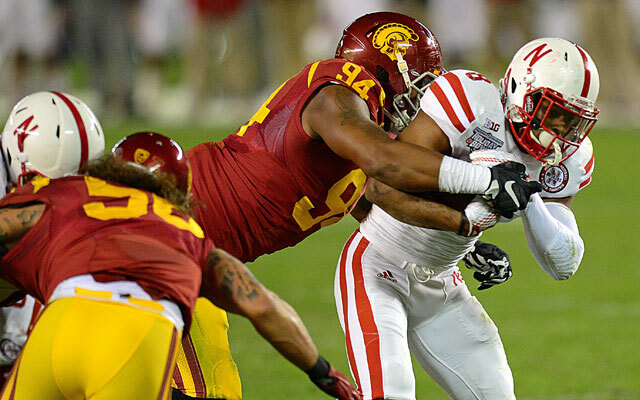 USC defensive end Leonard Williams should be a top five pick for the 2015 NFL Draft. There is a reason that USC defensive end Leonard Williams is referred to as the Big Cat. Williams is 6’5” and 300 pounds, but he doesn’t look 300 pounds. He is lean for a guy his size and he moves extremely well. Williams is a versatile player that could play any defensive line position in any scheme. His length and long arms would be a great fit for a 3-4 defensive end, but he could do anything you need from a defensive lineman. At USC, he played all over the line, taking advantage of matchups. Williams is very strong at the point of attack and is hard to move out of the hole. He has the strength to rag doll offensive linemen at will. He also tied for the team lead with 7 sacks and had 80 tackles and 9 ½ tackles for loss. His body type is similar to J.J. Watt of the Houston Texans. That is not to say that Williams’ career will be as successful as Watt’s. Watt is a workout warrior, but if Williams puts in that kind of work, who knows? At the NFL Combine, Williams ran a 4.97 40 yard dash which is very good for a 300 pounder. He also looked very smooth in positional drills. Despite his big frame, he plays with good pad level and is tough to submarine in short yardage situations. He is the type of player that demands a double team on every play. Williams is listed by some scouts as the best overall player in this draft. I doubt Tampa Bay drafts him #1 overall because of their need for a quarterback. However, I can see Williams going as high as #2 to the Titans and I highly doubt he makes it out of the top five. No matter where he is drafted, Williams has the potential to be a highly productive defensive lineman that makes multiple Pro Bowl and All-Pro teams. This entry was posted on April 8, 2015 by draftmaniacs in Draft profiles and tagged 2015 NFL draft, Leonard Williams, NFL, NFL Draft.